Jason and I decided to decorate Titus’s nursery in an adventure/travel theme. We thought it was fitting since we both love to travel, and we just thought it would be super cute and something that he could grow with. We are so happy with how it turned out! Now, all we need is a Titus ;). 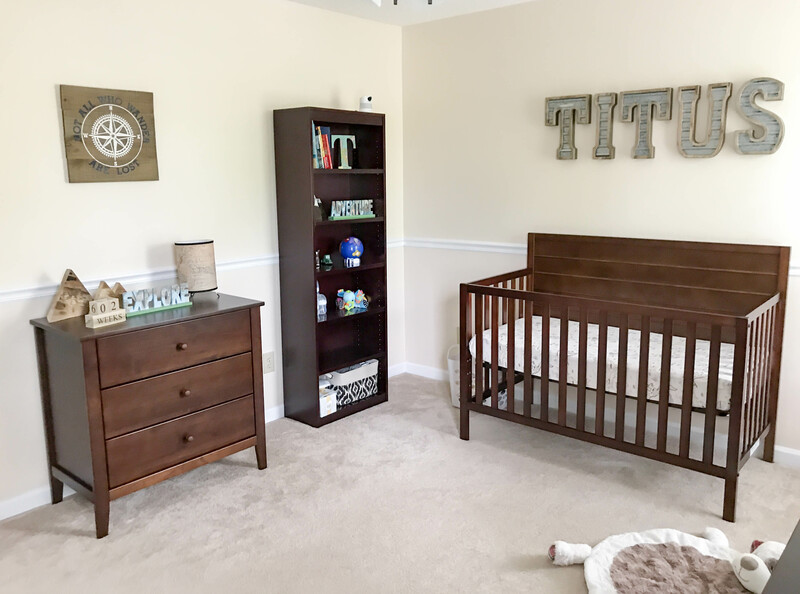 We went with dark furniture – this crib, 6-drawer dresser, and 3-drawer dresser from DaVinci. They are even prettier in person and match the bookshelf (that we already had) pretty close. The crib converts to a toddler bed and then to a twin/full size bed (and we went ahead and bought the conversion kits). 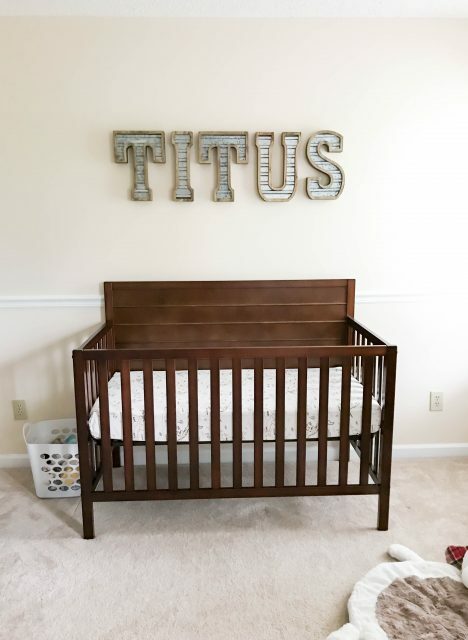 Jason really wanted to put “TITUS” above the crib and we found these cute letters at Hobby Lobby. I was skeptical but I love them! They were a BEAST to hang up but so worth it! 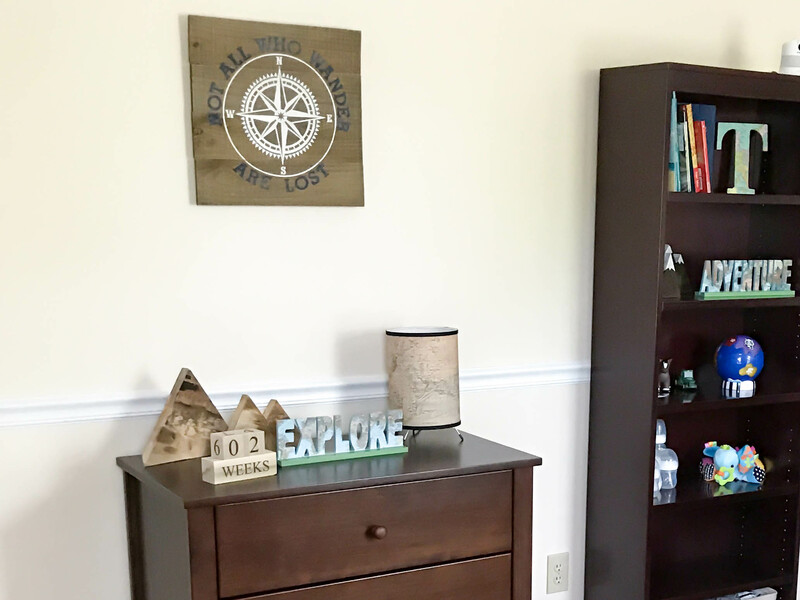 We also bought the wooden world and “explore” sign at Hobby Lobby (everything was 50% off – keep your eye out for a sale). 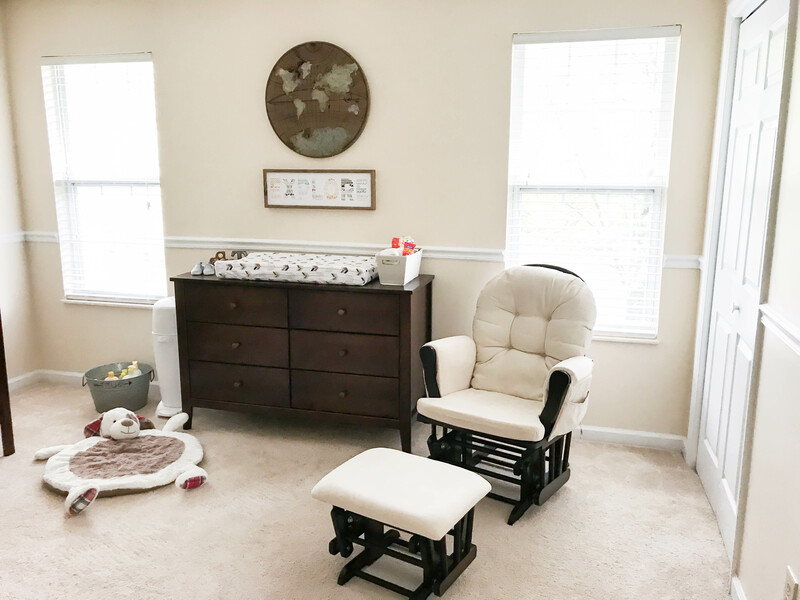 We debated about whether or not we needed/wanted some kind of rocker or glider in the nursery, but we ended up going with this glider from Wal-Mart. 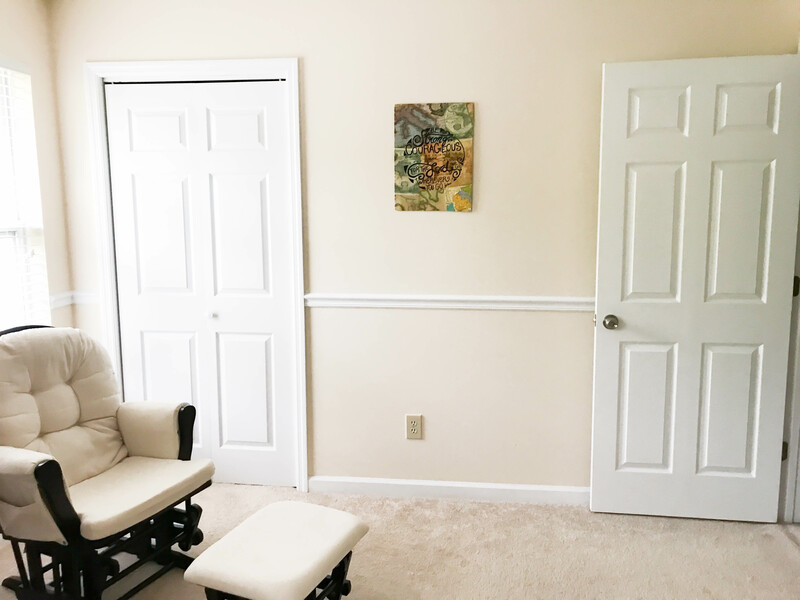 It matched the other furniture and was cheap enough that if we don’t really use it, we haven’t lost much. It is very comfortable though so I’m thinking we will use it! 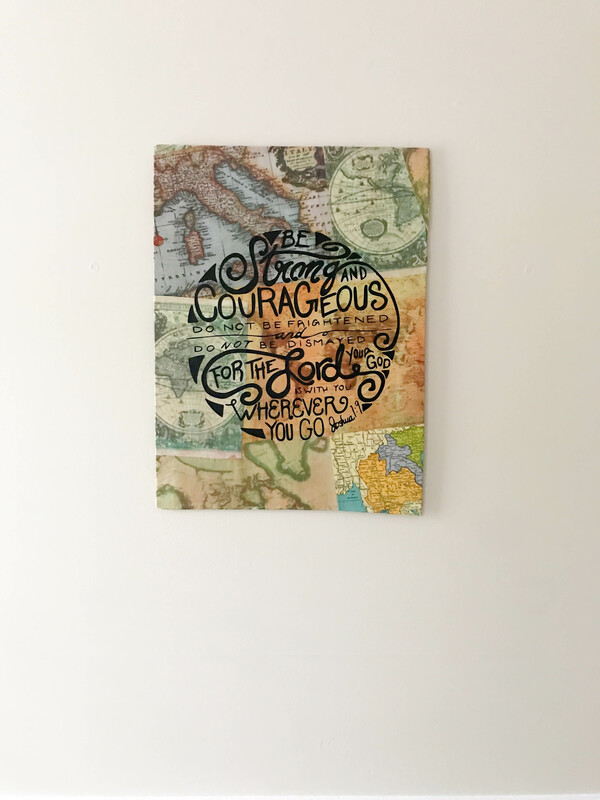 More wall decor from Hobby Lobby (haha!). The “explore” and “adventure” decor is from Wal-Mart. My cousin made the mountains as part of our baby shower table decorations and now we’re using them for nursery decoration (there’s another set on the bookshelf). My mom bought us the lamp. It’s hard to see in this picture, but the shade is actually a world map. So cute! My cousin made this wall hanging (below) and just like the mountains we used it at the shower too. Love it! Bonus points for being Jason’s life verse (Joshua 1:9) =). 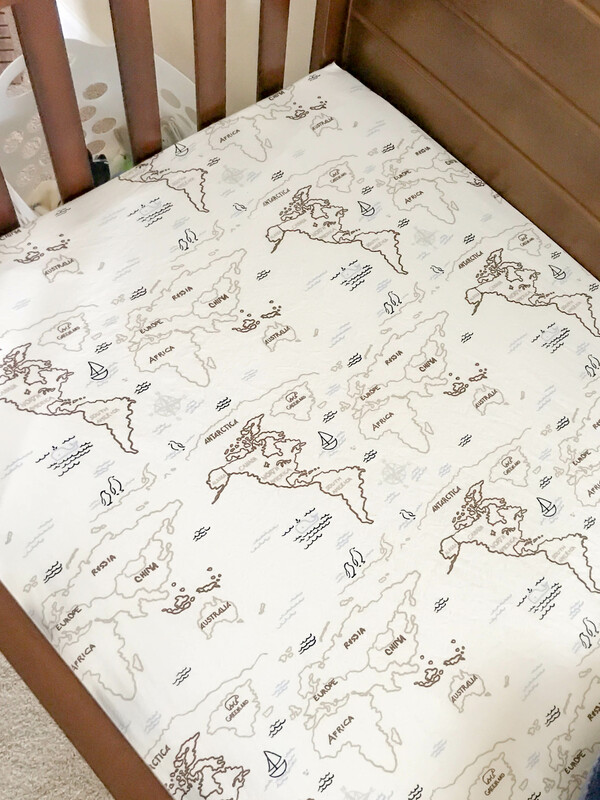 Jason was against any kind of crib skirt (he thought they looked girly), so we kept the crib bedding very simple – basically only a crib sheet. But I found a super cute one!! 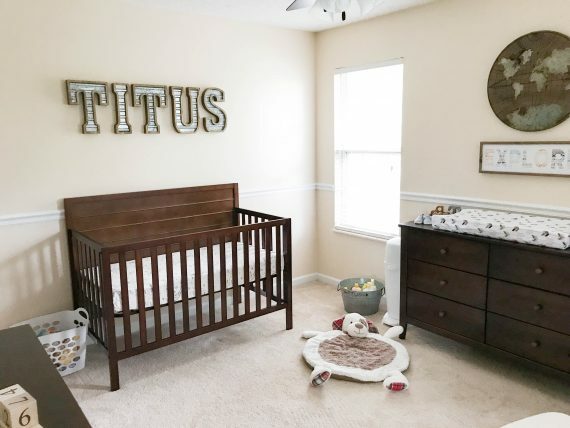 Obviously, I’m not an interior designer but I think Titus will like his room =).